when a person takes drugs or consumes alcohol regularly, his/her body becomes accustomed to having certain levels of the substance in it. Rehabilitation can be used to help such persons to recover from addictions, injuries, and even physical or mental illnesses, this was stated Pasighat MLA Kaling Moyong during the inaugural function of newly constructed “Drug addict rehabilitation center” at HDS compound on Monday. Moyong further said that people addicted to drugs often need the additional care and assistance that drug rehab provides. Rehabilitation is generally a safe process when undergone in a supervised medical setting but one reason for this is that drug rehab can only be truly effective when the patients are motivated, has desire to be there to change his or her addictive habits. Moyong further expressed that the drugs rehab treatment facilities help patients change their attitudes toward drugs. Many times drug addicts deny that they have an addiction and sometimes even claim that the drug is not harmful. The first step in rehab is to help patients get past this denial so that they can make an effort to change. Doctors, paramedical staffs and NGOs should help rehab patients to change their negative habits that are related to their addictions. This could include changing leisure activities or even changing aspects of the addict’s career or everyday life. 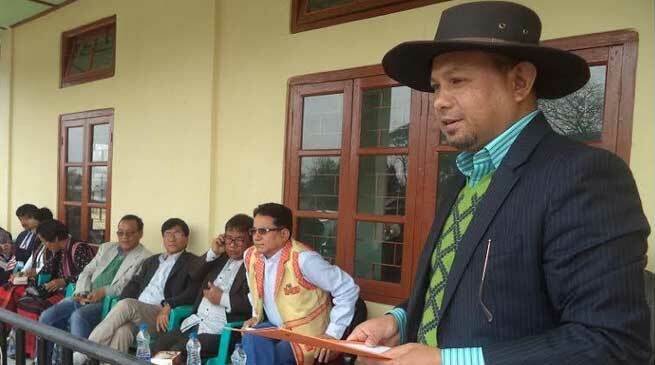 Moyong appreciated the efforts of untiring efforts of ABK (WW), DMO and EE T Jamoh and AE Bising Darin of WRD Pasighat for their concerted efforts. Taking privilege, the MLA apprised that water and power supply in the area is being improved and further disclosed various upcoming developments meant for Pasighat in particular. DC Tamiyo Tatak appreciated the efforts ABK (WW) and WASE for their fight against drugs and alcohol. He asked the MLA to provide fund suitably for construction of boundary wall to check encroachment. A committee would be constituted soon comprising JDHS, DMO, CC(PMC) and engineers to prepare the estimate and forwarded to the government accordingly for approval.